Russell Harrison Stonnill was born in Yeovil in 1888. He was baptised at St John's church on 19 April 1888. Russell was the youngest child of Yeovil's Great Western Railway's Station Master at Yeovil Town Station Richard Stonnill (1845-1899) and Harriet Rebecca née Danford (1849-1912), originally from Swansea, Glamorgan. Richard and Harriet were to have seven children; Richard Ernest (b1871), Alfred Walter (b1873), Harriett Gertrude (b1874), Thomas Saxby (b1877), Emma Jane Beatrice (b1878), Randall Joseph (b1881) and Russell. Most of the children were born in Wantage, Berkshire, where Richard was the Station Master, before the family moved to Yeovil in the early 1880s. In the 1891 census the family were listed living at the Town Station. Richard Stonnill died on 25 September 1899, leaving his effects, valued at £247 2s 6d (about £25,000 at today's value) to his eldest son Richard Ernest. By the time of the 1901 census Harriet, together with Beatrice and Russell, had moved to Station Road, Taplow, Bucks where she lived on her own means. By 1911 Harriet had moved back to her birthplace Glamorgan and was living at 8 Devon Terrace, Mumbles, Glamorgan, with her sons Richard and Russell, by now aged 23 and working as a corn merchant's clerk. Russell enlisted in London, giving his residence as Swansea, and joined the 5th (Service) Battalion (Princess Charlotte of Wales'), Royal Berkshire Regiment. His Service Number 11901 suggesting he enlisted in late 1914 or early 1915. The 5th (Service) Battalion was formed at Reading on 25 August 1914 and placed under command of 35th Brigade in 12th (Eastern) Division. It was initially based at Shorncliffe and then moved on to Folkestone in January 1915. Moving to Malplaquet Barracks at Aldershot on 1 March 1915. On 31 May 1915 the 5th Battalion landed at Boulogne, France. The Battalion engaged in various actions on the Western Front including the Battle of Loos. The Battle of Loos took place from 25 September to 13 October 1915 in France on the Western Front. It was the biggest British attack of 1915, the first time that the British used poison gas and the first mass engagement of New Army units. The French and British tried to break through the German defences in Artois and Champagne and restore a war of movement. Despite improved methods, more ammunition and better equipment, the Franco-British attacks were contained by the German armies, except for local losses of ground. British casualties at Loos were about twice as high as German losses. Russell Stonnill was killed in action in the day-to-day fighting on the Western Front on 1 June 1916, exactly one month before the 5th Battalion took part in the Battle of the Somme. He was aged 27. 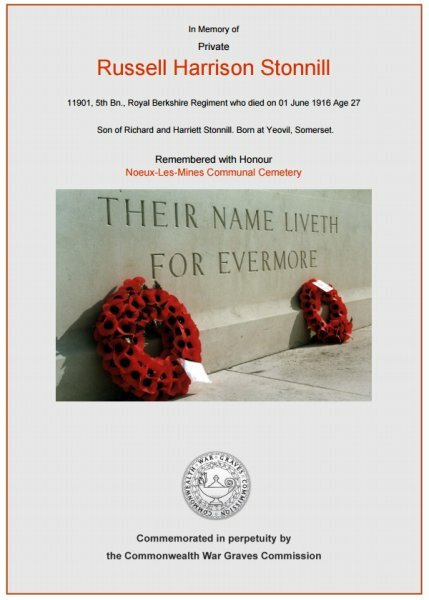 Russell was buried at the Noeux-les-Mines Communal Cemetery, Pas de Calais, France, Grave I.N.29., but his name is not on the War Memorial in the Borough. The Commonwealth War Graves Commission certificate in memory of Russell Stonnill.